Karen was born in Wilmette IL and started her Sweet Adelines journey right here in Region 3. She is delighted to be back "home!" Join us for a weekend of education and fun participation. You will sing and laugh, dance and interact! The goal is to learn through experience and to leave feeling glad you came! Karen has directed 3 choruses, ranking in the finals 6 times. She retired from directing Spirit of the Gulf, helping them win the coveted "Most Entertaining Chorus Award" three times. But now – she is back! Directing Spirit of the Gulf once again! She has won 9 international quartet medals - including the championship with Jubilation in 1985 and with "the BUZZ" in 2005. 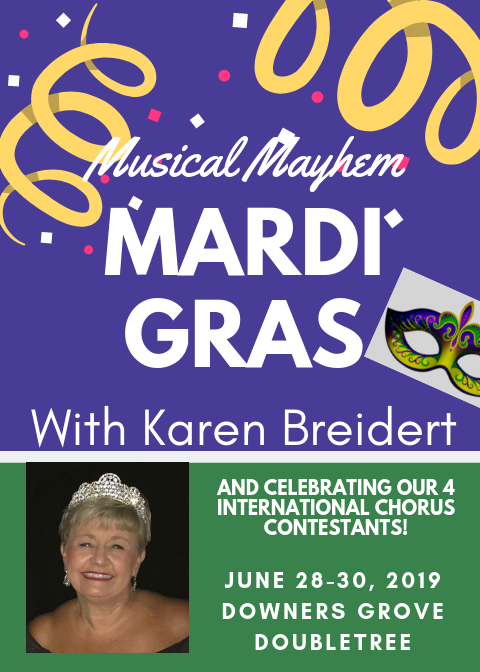 Karen was International President of Sweet Adelines from 1998 - 1999. Karen has a Bachelor's Degree in Education and Foreign Language and a Master's Degree in Guidance and Counseling. She lives in Jacksonville FL on the beautiful St. John's River with her husband Bob - also a barbershop quartet finalist. Since she began singing at age four with her family's professional singing group, The Drummond Family Singers, music has truly been in Karen's heart and soul for all of her life. "Key Leadership: Your Role in the Health and Positive Culture in Your Chorus, Your Region, and Sweet Adelines International"
"We Came Here To Sing"
9:15 - 10:45 "More Important Than Shoes"
Description: Exercises and ideas for improving the most important factor in what we do: singing! Let's become better singers instead of just learning more songs! 11:00 - 12:30 "The Personality Puzzle"
Description: Learn about the four temperaments and discover which one you are. Then learn how to maximize your strengths and minimize your weaknesses in order to get along with anybody! 2:00 - 3:30 "Barbershop: It's What We Do!" Desciption: A look at the special skills and techniques we use as barbershoppers and how to get better at each one! 3:45 - 5:00 "The Competition Experience"
Description: How to develop a healthy attitude about competing and turn competition into a joyful experience - before, during, and after! 9 - 12 "What Is Your Wattage: Light Up!" Description: Using a demo quartet and a demo chorus, we will look at each member's responsibility and privilege in the visual category. Besides some wonderful classes.... we will be sending off our 4 (!) Choruses to New Orleans on Saturday night. Join in the weekend of Mardi Gras fun!